Our partner from Nottingham, Professor Steve Benford, Mixed Reality Lab, just announced Artcodes – “the greatly extended and rebranded Aestheticodes app”. 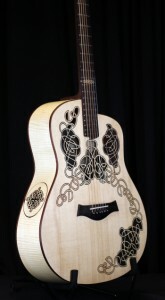 The Carol an guitar connects to its digital record through its decorative inlay. Specifically, the Celtic knotwork patterns spread around Carolan contain six different computer-readable codes hidden within them that the users can scan using a mobile device to connect to various webpages. The Artcodes app reads the codes in the patterns and then maps them onto particular webpages. The extended Artcodes app enables the users to create and share their own interactive experiences that involve scanning decorated objects. First, they can learn to draw scannable patterns that contain codes. Then they can map these to webpages of their choosing. Alternatively the users can appropriate an existing experience, opening it up and editing its codes to point at different pages of their choosing as described in the following Carolan blog post. Finally, they can share their new experience with other Artcodes users. They can also update their experience later on, resetting its codes to point at new web pages. The Carolan guitar team led by Professor Steve Benford are hoping that these features will empower all sorts of creative people become Artcode designers and users and that they can grow an active Artcodes community. To find out more, visit Professor Steve Benford’s latest Carolan blog post.